Enhance or restore capacity of beaches and dunes to protect inland areas from storm damage, flooding, and sea level rise, and maintain habitat and ecosystem function for coastal species. In Massachusetts, the sediments that form beaches and dunes range from sand to gravel- and cobble-sized material. Nourishment involves increasing the volume of a beach or dune by adding sediment of similar grain size or slightly coarser, from an offsite source, such as a sand and gravel pit (i.e., glacial deposits) or coastal dredging project. An artificial dune is a shoreline protection option where a new mound of compatible sediment is built along the back of the beach, seaward of the area to be protected. Artificial dunes may be called cobble berms when larger pebble- and cobble-sized materials are used. Reduce risk of storm damage and flooding by adding sediment to the beach and dune system while minimizing impacts to shoreline systems including coastal and marine habitats. 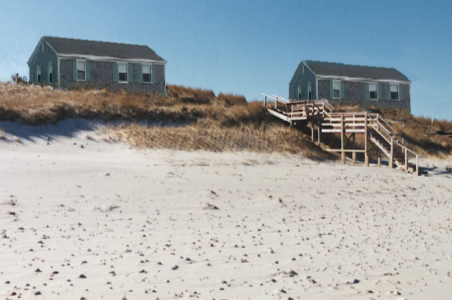 Coastal beaches and dunes change constantly in response to wind, waves, tides, and other factors such as sea level rise and human changes to the shoreline system. Climate change will result in greater storm damages to existing coastal development and an increase in recurring storm damage to individual properties. A range of shoreline stabilization methods exist to address risks from storm damage, erosion, and flooding to coastal properties; however, some methods can unintentionally do more harm than good by worsening beach erosion, damaging neighboring properties, impacting marine habitats, and reducing the capacity of beaches, dunes, and other natural landforms to protect inland areas from storm damage and flooding. This diagram shows a beach and dune nourishment project that added sand to the seaward side of an eroded dune and beach profile to enhance the ability of the system to buffer wave impacts. Increasing the volume of a beach or dune through nourishment provides a physical buffer between the sea and inland areas. This buffer can naturally shift during storms, unlike hard structures, such as seawalls and bulkheads. As waves hit a beach or dune and sediments move and shift, the wave energy is absorbed, protecting landward areas from the full brunt of the storm. 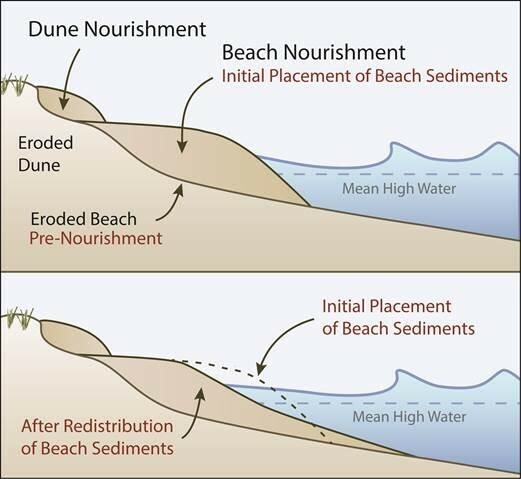 Beach and dune nourishment projects not only increase the direct level of protection to inland areas by acting as a physical buffer, the added sediment also supports the protective capacity of the entire beach system (i.e. the dune, beach, and nearshore area); nourishment projects restore the dry beach at high tide, increasing the beach’s value for storm damage protection, recreation, and wildlife habitat. Sediment eroded from the beach is not lost or wasted, but added to the surrounding beach and nearshore area where it dissipates energy, reducing the strength of incoming storm waves. Sand on the dry beach is also blown by the wind to form dunes at the back of the beach. Dunes provide an additional level of protection to landward areas due to their height above the beach and they serve as a reservoir of sand to supply sediment to the beach in storm events. To maintain dunes as an effective physical buffer, sediment may need to be added regularly to maintain the dune’s height, width, and volume at appropriate levels. Beach nourishment is appropriate where there is a need to increase the size of the beach, except where the project would result in smothering sensitive habitats, including salt marsh, shellfish habitat or eelgrass. In the case for dunes, nourishment is appropriate for almost any area with dry beach at high tide and sufficient space to maintain some dry beach even after the new dune sediments are added to the site. Care should be taken to minimize impacts to sensitive habitats, including shellfish, and nesting habitat for protected shorebirds and turtles. Nourishment projects require the use of compatible sediments. Both sediment size and shape need to be considered. The appropriate grain size to be used for nourishment projects is determined in comparison to the native beach grain size distribution; the percentage of sand-, gravel-, and cobble-sized sediment should match, or be slightly coarser than, the existing (i.e. native) beach/dune sediments. Sediments that are too fine grained will erode quickly, reducing project effectiveness and potentially impacting nearby species and habitats. Sediments that are too coarse grained may not move and shift as intended and could increase erosion and other problems. Sediments with a larger grain size may negatively affect the quality of the beach for recreation and habitat for protected species (i.e., species that are considered endangered, threatened, or of special concern in Massachusetts). The shape of the material brought in is also important, primarily for larger-grained sediments (gravel and cobble). These sediments should be rounded (like natural beach sediments) rather than angular (crushed) because rounded grains readily roll and slide against each other, and this movement dissipates more wave energy. If rounded material is not used, the ability of the beach to move and shift can actually be reduced rather than improved by the project. The volume of sediment needed for a beach nourishment project will depend on the desired level of protection, the predicted wave energy and storm surge for the area, and site constraints (such as proximity to sensitive resource areas/coastal habitats). For projects being designed to provide a specific level of shore protection, the volume of sediment needed will be determined primarily by the elevation and width of the beach and existing dune relative to the predicted water level during a major coastal storm event and the level of protection desired. 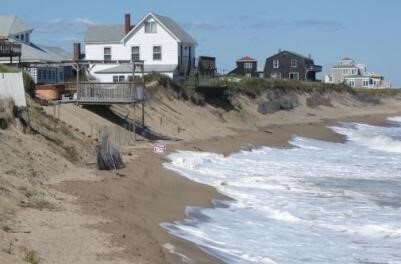 The lower the existing beach/dune and the higher the predicted water level during a storm, the greater the volume of material that is needed to provide protection in a major storm event. Steep beaches and dunes are unstable and may erode rapidly and cause problematic scarps (carved out areas in the dune or beach with an almost vertical slope). The slope selected for the project will be based, in part, on the existing and adjacent beach slopes, the width of the dry beach, the grain size of the dune sediments, and whether there is habitat for protected species present. 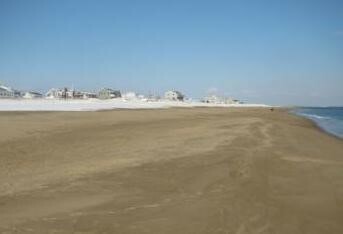 In addition, there should be some dry beach between the dune and the average high tide line to prevent rapid erosion. Beach and dune nourishment can be used in combination with other shoreline stabilization techniques. For example, if there is no dune landward of the beach nourishment project, planting the back part of the beach with native, salt-tolerant, erosion-control vegetation with extensive root systems is highly recommended to help hold the sediments in place, and trap windblown sand to build up a dune as an added buffer to landward areas from flooding. Sand fencing can also be installed to trap windblown sand to help maintain and build the volume of a dune at the back of a beach nourishment project (for more information, see StormSmart Properties Fact Sheet 6). However, planting and fencing may be restricted in nesting habitat for protected shorebirds and turtles. Siting appropriate location for sediment placement: care should be taken when delineating all habitat areas and customizing the grain size, slope, placement and other design elements. Nourishment projects near salt marsh habitat, horseshoe crab spawning grounds, shorebird and other sensitive habitats can smother plants and animals if they are not designed with these resource areas in mind (i.e., if beach and dune sediments can erode quickly and move into these areas). In addition, nourishment projects in nesting habitat for protected shorebird and turtle species can inhibit nesting success if they are not designed and constructed appropriately. Time of year for construction: nourishment projects can unintentionally impact coastal species and habitats, particularly on nearby beaches and nearshore areas; construction of projects should be timed to avoid horseshoe crab spawning, larvae shellfish settlement and spawning, and shorebird nesting. Vegetation density: planting may need to be modified to allow for successful nesting (e.g., shorebirds) or spawning (e.g., horseshoe crabs). Vegetation type choice: nourishment projects can unintentionally smother existing vegetation that helps to stabilize the area, an impact that can typically be addressed by replanting similar vegetation on the new beach or dune area. Generally, regulatory programs are supportive of projects that add sediment to the beach and dune system rather than proposing a hard structure. To obtain permits, projects need to demonstrate they are designed with appropriate sediment and slopes in mind, and are not located in or too near sensitive habitat areas (e.g., salt marsh). These factors ensure potentially negative impacts to protected and regulated natural resources are minimized. See the Massachusetts Office of Coastal Zone Management’s StormSmart Properties Fact Sheets for more information on permitting and regulatory standards as well as maintenance.